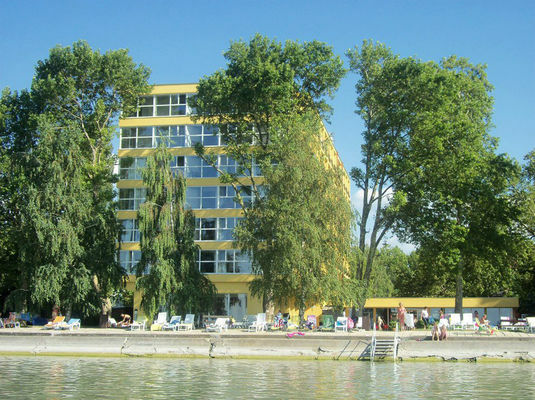 Hotel Lido Siofok *** with its own private beach is located in the most beautiful promenade of Siofok, directly on the shore of Lake Balaton. Our hotel ensures both the active and familiar relaxation for the guests during the seasonal opening time. Each of the 132 rooms of the Hotel Lido are equipped with panoramic balconies, air-conditioning / EUR 8/night/room /, showers, mini-fridge and satellite LCD TV's. Family and connected rooms guarantee our guests' comfort. In our hotel breakfast room, drink bar provide a special comfort for our guests. In the mornings we serve your breakfast in the form of buffet. All of our guest can take their choice according to their taste. Our restaurant Pater 100 m away offers both the national and international dishes for our guests. Our private beach give you an unforgettable holiday. 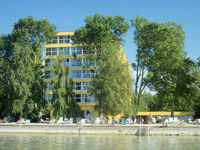 In Hotel Lido Siofok *** 24-hour reception, central safe, fax are available. In our Hotel we offer free Internet and WiFi systems connections. We offer closed parking lot, for a charge of Euro 5/night/car, to our guest during the holiday. • Half board is available at 2500 HUF per person. • The hotel's own parking lot is available for the guests at 1500 HUF per car per day. • Children under 2 stay free in their parents' room. • Pets are allowed for an extra charge of 1500 HUF per day. • In case of late cancellation or no-show the hotel charges 50% of the booking value as penalty.